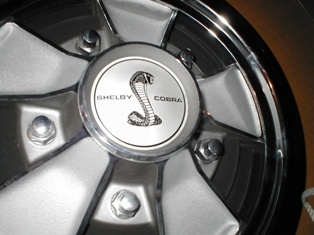 All 1968 Shelbys were originally equipped with five 15x6 inch rims. These rims were painted semigloss black. 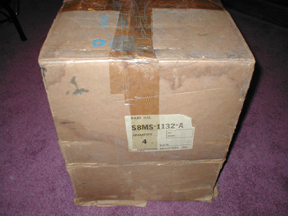 The part number for the rims is C8AZ-1007-B. The rim has an ID number of C8AA-1007-DW. This ID number along with a date code is stamped into each rim. All 1968 Shelbys were equipped with full sized spare tires.There were no space savers. 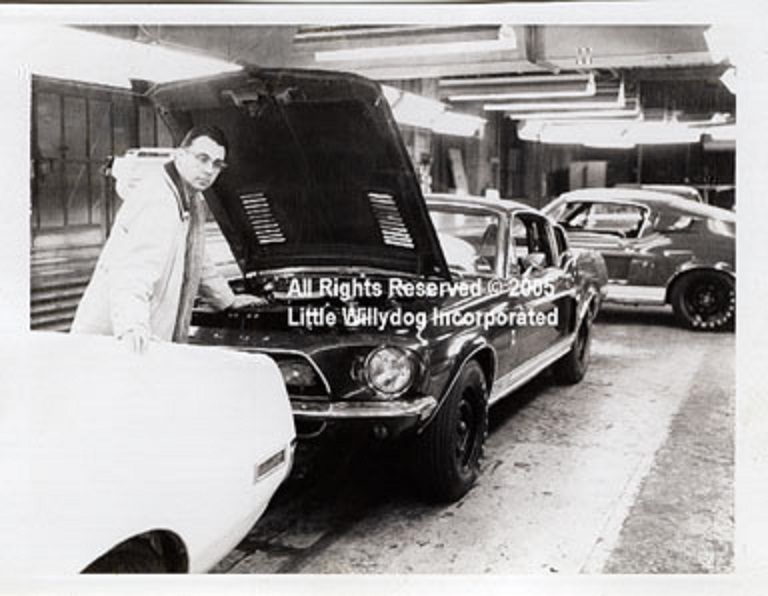 As a matter of fact, only a handful of regular production Mustangs had the space savers in 1968. Three different GOODYEAR tires were used during 1968 production. All three of these tires are now available as reproductions. The Speedway tires were most likely used on all GT350 and GT500 cars. 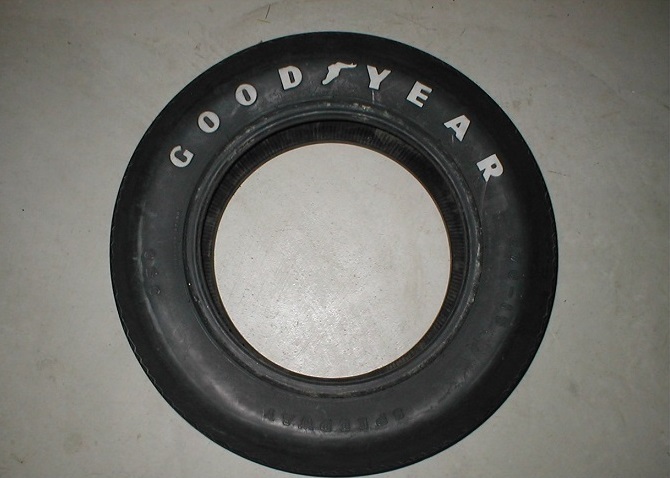 The Goodyear "Speedway 350" tire came in two varieties. 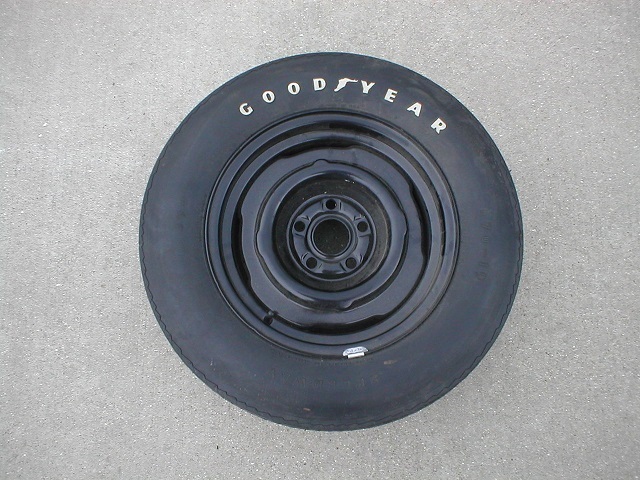 One style of tire featured the word "Goodyear" in small raised, white letters. The tire size is E70x15. This tire was used at the beginning of production through mid-January 1968. The tire pictured above is an original. A second tire used was also a Goodyear Speedway. This tire has the word "Goodyear" in large white letters. The size is E70x15. This tire was used from approximately mid January 1968 until April of 1968. The photo shows an original tire. 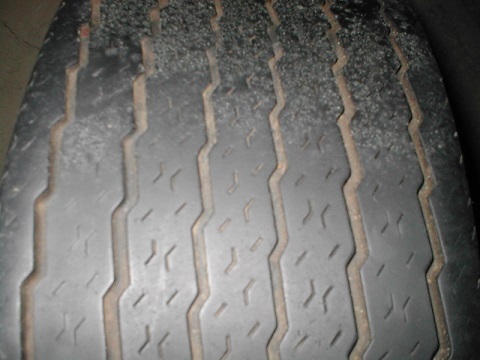 Here is the tread pattern on an original Speedway tire. The large and small tires have the same tread pattern. The third tire used was a Goodyear Custom Wide Tread / Polyglas. It is also an E70x15. This tire is a black sidewall tire with no white lettering. This tire was used beginning in April of 1968. It was most likely used on all GT500 KRs. This is an original tire. 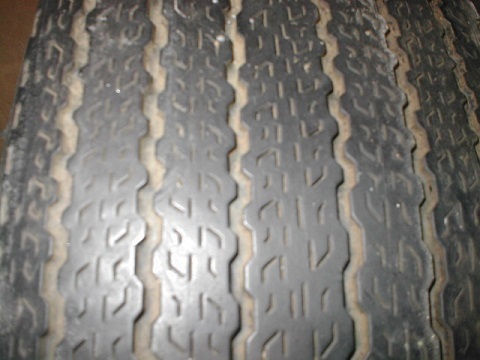 Here is the tread pattern on an original Polyglas tire. It differs from the Speedways shown above. Every 1968 Shelby came from AO Smith a nice box of shiny, new hubcaps in the trunk. I'm not saying they all made it on the cars, but that's what was intended. Hubcaps were the subject of a service bulletin. The bulletin warns that due to excessive hubcap weight, the wheel and tire should be balanced with the hubcap in place. 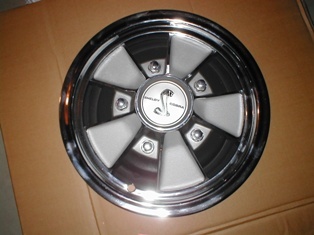 Just for the record, all of the major shows now expect hubcaps! Here is an original cardboard box of hubcaps. Talk about rare ! Are you confused about new tires? If you have put new tires on your car, you are probably familiar with the modern P-metric tire system. The direct modern replacement for an E70x15 tire is a P205/70R15. Many will people will find that tire to be too tall and skinny for modern day preferences. Certainly you can use another tire, but make sure you consider the following. If the tire is too wide it may rub on the upper control arm. If you have altered the suspension with lowering springs or by relocating the upper control arms, you will need to check the tire, taking the suspension travel into account. I have also seen tires rub or pull on the wheel lip moldings if they are oversized. Turn the steering wheel in both directions and take into account the suspension travel. Some tires will appear to be fine until the suspension travels. Lastly, make sure you recheck your speedometer when changing tires. It may be necessary to change your speedometer gear to achieve an accurate reading.